Perfect for unwinding and enjoying an unforgettable Riviera Maya vacation with family or friends, the three-bedroom, ocean view Master Suite offers every luxury. 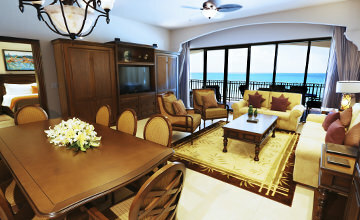 It is divided into a Master Suite and two Junior Suites, each with its own independent entrance. The Master Suite has a spacious bedroom with a king-size bed, full bathroom and dressing area. The gourmet kitchen has state of the art appliances and cookware, a living and dining room with a half bathroom, a laundry room and a private terrace. The Junior Suites both have a bedroom, dressing area, bathroom, kitchenette and a balcony. Amenities include central air-conditioning, Wi-Fi, Jacuzzi, signature bedding and designer label bathroom amenities, an entertainment center, flat screen TVs and in-room safes. Stylish granite countertops, tile designs, tropical hardwood cabinets and original artwork complement the luxurious furnishings. Enjoy a breathtaking view of the Caribbean from the open-air furnished terrace. Size: 3,132 square feet Sleeps up to 10 people.